DUPONT press release: In response to health, safety and sustainability needs – primarily for electrical applications such as contactors, circuit breakers and housings – DuPont Performance Polymers has extended its portfolio of halogen-free materials, with a new flame-retardant (FR) nylon 66 with enhanced thermal ageing. “In a comparative test carried out on ISO tensile bars according to ISO 527 in DuPont’s European Technical Center in Geneva, Switzerland, data showed that our halogen-free nylon 66, DuPont Zytel® FR95G25V0NH, retains 80 percent of its tensile strength when exposed to 200 °C for more than 1,000 hours, while incumbent materials only retain 50 percent”, said Antonio Nerone, global segment leader electric & connectors. The new Zytel® FR grade uses a patented combination of flame-retardant copolymer and stabilizer to improve melt stability, flow and surface appearance and reduce mold deposit. The new material also offers a Comparative Tracking Index (CTI) rating of 600V. This rating is given to polymeric materials to compare their resistance to carbon tracking and is determined by test methods defined by IEC 112 or UL 746C. The CTI value is subsequently used for electrical safety assessments of electrical apparatus. Applications that can take advantage of this level of performance will typically include the insulating elements and housings for circuit breakers, contactors, transformers and motors. The electrical industry is seeking alternatives to the use of halogens as flame retardants for health, safety and recycling reasons. It also has to consider the WEEE (Waste Electrical and Electronic Equipment) Directive, which requires the separation of halogen-containing materials. A Polymeric Solution For A Bromine Problem! Manufacturers claim that brominated flame retardants are the most effective additives for slowing down the spread of flame on polymers that catch fire. Over the years, some of their products have come under regulatory scrutiny because of concerns over bioaccumulation and toxicity. One of these is hexabromocyclodo­decane (HBCD), long used to help polystyrene foam insulation meet fire-safety building codes. The big three producers of brominated flame retardants—Albemarle, Chemtura, and ICL Industrial Products—say they have found viable alternatives to HBCD and other flame retardants. Brominated flame retardants built with long polymeric backbones can provide the flame-retarding benefits of bromine and decrease the possibility of toxicological side effects, they say. With molecular weights more than 1,000 daltons or so, the polymeric molecules are too big to penetrate cell walls and thus shouldn’t bioaccumulate or be toxic, they explain. Efforts to develop a polymeric brominated flame retardant as a substitute for HBCD serve as a model of how regulators as well as users and makers of flame retardants ought to proceed, industry executives say. “It is a really good case study for taking one thing out of the market and bringing the next thing forward,” says Joel Tenney, director of advocacy for ICL’s industrial products segment. Interestingly, the effort is not being led by a producer of brominated flame retardants. In 2004, Dow Chemical saw the writing on the wall for HBCD, the additive in what is perhaps Dow’s most recognizable brand: Styrofoam extruded polystyrene foam insulation. HBCD had been under fire for a host of environmental and health reasons. The compound is fat-soluble, and according to studies cited by the Environmental Protection Agency, it bioaccumulates and is linked to toxicity in aquatic animals and to developmental problems in mammals. In 2008, Norway proposed the listing of HBCD as a persistent organic pollutant under the Stockholm Convention. That same year, HBCD became a candidate for a Substance of Very High Concern designation under Europe’s Registration, Evaluation, Authorisation & Restriction of Chemical substances (REACH) regulation. In the U.S., EPA initiated an action plan for HBCD in 2010 and this year proposed rules that would require companies to notify EPA if they use HBCD on consumer textiles sold in the U.S. (see page 34). “We saw there was pressure on brominated flame retardants building up over recent years, and even though we still believe that HBCD is safe to be used in foams, we started very early on to look into more sustainable solutions,” says Inken Beulich, senior R&D manager for Dow Building Solutions. To find an alternative, Beulich says, Dow applied its polymer expertise as well as its competency in environment, health, and safety modeling. The firm’s goal was to come up with a new flame retardant that the entire polystyrene foam industry, not just Dow, could use. The company explored bromine-free chemistry but eventually settled on a bromine-based approach. The key breakthrough, Beulich says, was finding the right polymer backbone: a styrene-butadiene block copolymer. The polystyrene block, she says, ensures good miscibility with the polystyrene foam matrix. The polybutadiene block gets brominated. It stands to reason that Dow stuck with bromine, says James Innes, president of the consulting firm Flame Retardants Associates. Burning typically occurs when oxygen reacts with free radicals in the gas phase, he explains. Brominated flame retardants trap these free radicals, preventing them from reacting with the oxygen and thereby slowing down the burning process. With polystyrene, the heat of the fire pyrolyzes the polymer and causes styrene monomers to break off. “A radical trap helps limit the combustion of the break-off products,” Innes says. When Dow started working on its polymeric flame retardant, Albemarle, Chemtura, and ICL had been experimenting with their own candidates for HBCD replacement. Dow consulted with the three firms early in its development process, and the three quickly found that Dow’s new molecule outperformed their own. The polymeric brominated flame retardant performs as well as HBCD in all important respects, Beulich says. It has equivalent flame-retarding ability, and it doesn’t hurt the mechanical, physical, and insulation properties of the foam. Furthermore, ICL’s Tenney adds, the Dow technology works with both extruded and expandable polystyrene foam. “HBCD was a unique chemical because it satisfied both of these production approaches,” he says. The scale-up of the Dow technology will depend on local regulations to restrict HBCD, as well as the ability of foam and flame retardants companies to adopt the new technology. All three major makers of brominated flame retardants have taken licenses from Dow and are in various stages of commercializing the product. Chemtura is already producing the flame retardant commercially under the Emerald Innovation 3000 name. Albemarle is building a plant to make it, under the GreenCrest name, at its Orangeburg, S.C., site. ICL says it is selling small quantities of the flame retardant so customers can start transitioning to the new technology. It will take Dow some time to switch its close to 20 Styrofoam plants to the new technology, Beulich says. The firm will first use the new flame retardants in Japan, followed by Europe and North America, and then the rest of the world. BASF is also planning to use the Dow technology with its polystyrene foam product line. In fact, polymeric flame retardants have been available for a while. Brominated polystyrene has been used for the past decade in applications such as electronic connectors made from polybutylene terephthalate and high-temperature nylon. Today, makers of flame retardants are busy introducing polymeric alternatives to decabromodiphenyl ether (decaBDE), a workhorse flame retardant that’s used in electronics housing and a host of other applications. In 2009, EPA expressed concern about the environmental impact of decaBDE and its potential link to cancer and diminished brain function. The agency obtained commitments from the three makers of flame retardants to phase out the chemical for most uses by the end of this year. Albemarle’s GreenArmor product was specifically designed to substitute for deca­BDE. Clary won’t disclose details about the molecule other than to say it is a brominated “cousin” of polystyrene. Chemtura and ICL both offer polymeric substitutes to decaBDE as well. A draft report EPA issued this summer on alternatives to decaBDE noted that polymers have relatively low bioaccumulation and toxicity. The report did point out that the molecules, much like the plastics to which they are added, have a tendency to persist in the environment. If polymeric flame retardants become widely used, EPA cautioned, further study of their degradation might be needed. Chemtura is looking to plunge even further into polymeric flame retardants with its Greener Innovation Grant program, through which it sought grant proposals from academia on sustainable flame retardants. “We encouraged proposals that would look at sustainable brominated flame-retardant systems because of the benefits that halogenated flame retardants have in their versatility, efficiency, and effectiveness,” says Marshall Moore, director of technology, advocacy, and marketing at Chemtura’s Great Lakes Solutions unit. The company is awarding four grants to yet-to-be-disclosed university researchers. Albemarle’s Clary hopes polymeric flame retardants foster public confidence. Small-molecule products have been painted with a broad brush, he says. Decabromodiphenyl ethane, for example, is a decaDBE replacement that actually has an excellent toxicological profile, he adds. Filed under: Flame Retardant |	Comments Off on A Polymeric Solution For A Bromine Problem! Anixter : Even though they are still predominant in the industry, the use of halogenated compounds in wire and cable has decreased over the past several years. Polymers such as PVC are being phased out in certain applications, especially in enclosed, high-density cable applications. Relatively new low-smoke and zero (or low) halogen compounds, which are typically polyolefin based with a heavy doping of inorganic hydrated minerals, give off cleaner smoke when burned. This mineral doping also reduces certain physical properties so the wire and cable industry has attempted to develop low-smoke and halogen-free compounds that have the same or better functionality than the common halogenated compounds currently in use in industrial applications. However, it is important to understand that smoke production and halogen content are not mutually exclusive. Halogenated low-smoke compounds exist as do halogen-free compounds that are not low-smoke. It is always best to consult with wire and cable experts when choosing a cabling solution. 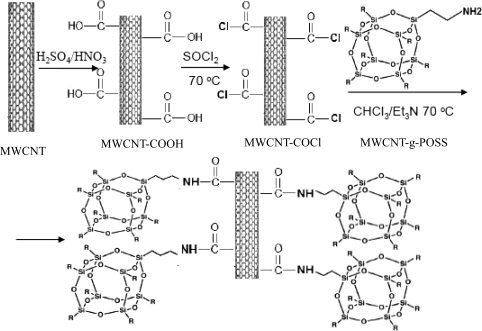 Multiwalled carbon nanotubes (MWCNTs) were covalently functionalized with polyhedral oligomeric silsequioxane (POSS). The results of Fourier Transform Infrared Spectroscopy, Raman spectroscopy and Transmission Electron Microscopy indicated that POSS particles were grafted onto MWCNTs. The POSS content determined by thermo-gravimetric analysis (TGA) was estimated to be ∼25 wt%. A stable and superhydrophobic surface characteristic was observed for the film made of MWCNTs grafted with POSS (MWCNT-g-POSS) even after an exposure to a high-humidity environment for three weeks. The water contact angle of the sample was measured to be 160.5 ± 1.1°. Buckypapers were made from both pristine MWCNTs and chemically converted to MWCNT-g-POSS. The pore structures of the buckypapers were characterized by mercury intrusion porosimetry and scanning electron microscopy. The flame-retardant performance of the buckypaper-based composites was evaluated by TGA and microscale combustion calorimetry (MCC) test. The TGA test results indicated that the MWCNT-g-POSS dramatically increased the char residues of the composite. Approximately 72% reduction in peak heat release rate was achieved for the MWCNT-g-POSS /resin composite from the MCC testing. The fire-retardant mechanism was discussed. Applications are invited for this PhD studentship which has been funded by the European Union Framework 7. The studentship is tenable for up to 3 years for a PhD (via MPhil route) [subject to satisfactory progress]. The studentship will cover the cost of tuition fees for UK/EU residents plus a maintenance grant of £16,000. The successful applicant will start on 1 January 2013. International applicants may apply but will be expected to pay the difference between the UK/EU and International Fee Rate. This exciting project addresses one of the major challenges in European fire safety – the replacement of eco toxic halogenated flame retardants with safe alternatives. There are three studentships associated with this project and applicants will be considered for all three studentships unless indicated otherwise. This project involves the measurement of thermophysical properties of novel CNT based polymer nanocomposites as a function of temperature (e.g. heat conductivity, rheological properties, heat capacity, heat of degradation etc.) and the effects of these parameters have on a burning polymer. A sophisticated numerical model such as ThermaKin will be used to bring these parameters together to show how they affect the burning behaviour. A versatile and enthusiastic chemist or physicist is required in order to enhance our understanding of the influence of physical properties on burning behaviour to optimise fire retarded formulations and quantifying the effects of physical properties (absorptivity, emissivity, heat capacity, thermal conductivity, heat of decomposition, heat of combustion etc.) on burning behaviour, and use this data to model materials’ ignitability and heat release rates. The project is led by world experts in the field, Prof Hull and Dr Anna Stec, editors of Fire Toxicity, (Woodhead Publishing, Cambridge, UK), based at UCLan. Informal enquiries should be made to Dr Anna A Stec, aastec@uclan.ac.uk or Prof Richard Hull trhull@uclan.ac.uk. Applicants should have or expect to receive a good honours degree in chemistry or related subject preferably 1st class honours or equivalent. 1st announcement and Call for Papers for the 13th international conference Interflam 2013. As with previous conferences the programme will have a core plenary and several parallel sessions, supported by posters, exhibitions, demonstrations, workshops, discussion groups and student activities. The conference is intended to create an interface between the researcher, the fire safety engineer and the designer so that good fire science can be promptly harnessed to provide a safer built environment.